New Pathways Programme - Toastmasters Nice. The new PATHWAYS is an awesome concept. It has been carefully structured to serve individual member needs and requirements. Paths lead to educational, scientific, industrial, numeric, artistic and many other areas. Just Choose your particular 'path' and go for it! advanced books. Navigate the projects and your progress in the online Base Camp. Think of a path like a college major. The point is not to major in everything, but to choose a major that will benefit you, and to aim for completion. Toastmasters’ highest designation, the DTM, only requires completing 2 paths. 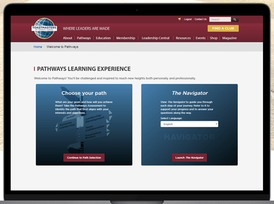 Choose a path to learn…..
All paths focus on public speaking and leadership, and all have a variety of electives to choose from, but here are the skills and activities that make each path unique. manage change, and take on a leadership role. and develop others, and lead a project with a team. a proposal, manage projects, and lead a project with a team. project, manage time, lead a team, and coordinate your own event. MS Motivational Strategies - Motivate others, understand emotional intelligence, practice active listening, and organize a team buildingevent. PI Persuasive Influence - Practice active listening, handleconflict resolution, lead in difficult situations, and lead a project witha team. PM Presentation Mastery - Work on body language, speak persuasively, manage a difficult audience, and give a keynote speech. SR Strategic Relationships - Build connections and network, understand diversity, handle public relations, and lead an organization in a volunteer capacity. TC Team Collaboration - Motivate others, practice active listening, collaborate with a team, and take on a leadership role. VC Visionary Communication - Develop a communication plan, communicate change, identify your vision, and create a plan to implement your vision. 5 levels in a path Each level has 2-3 projects of increasing skill. 14 projects to complete a path That includes about 15–16 prepared speeches and 2–4 medium-tolarge leadership activities, parts of which you can complete outside Toastmasters. A project could include a speech (sometimes two), a leadership activity, a resource or worksheet to help you organize and document, a short quiz, or any combination of these things. Most include an evaluation form and quick self-assessment. Navigate through each project online, or print it out if you prefer. * Speeches are 5-7 minutes unless otherwise stated (see project descriptions). *I recommend not ordering printed books from oastmasters, as not all paths and projects are available that way. Just print the PDF if you prefer paper. You will print your speech evaluation form eitherway. What are the speech topics? Like the old program, some speeches have a defined topic, such as “Understanding Your Communication Style.” You can find ways to be creative and interesting with these! Other speeches allow you more freedom in choosing a topic, such as “Inspire Your Audience” or “Effective Body Language.” These are in blue. See the following pages for speech topics by path and level.